I was celebrating my first year anniversary with DH Kent and we took two trips of a lifetime - one on safari to Kenya where I had my first hot air balloon ride (not to mention seeing all those wonderful lions, giraffes, hippos, zebras etc as close as 3 feet away!) and another to Greece where we toured the southern portion of the country and also had a 3 day cruise to 2 islands and Ephesus in Turkey! 2. Five things on today's "to do" list. I'm a lifetime member of Weight Watchers - so I try to eat any of the 100 calorie snack packs when I'm snacking or the 94% fat free popcorn - but I love brownies and chips too! All in moderation right?!?! I'd build a log house on a lake with a view of the mountains! I haven't moved very far from where I started! These are all towns in Massachusetts - Saugus, Framingham (while in college), Wakefield, Reading. Now I'm tagging the following blogging friends so they can answer these questions for us - be sure to check out their blogs! Silke over at her blog My Life has just tagged me. Thanks Silke for thinking of me and please check out her fun blog! This is the second time I've been tagged - you can check out the first one listed on the right column under "Look Here to Find" . So now I will list 7 more Random Facts about myself to help you get to know me better. 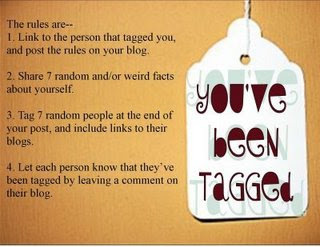 And then I tag 7 other bloggers - so please check them out at the bottom of this post! 1. I love to sit on the dock at our camp in NH and just read a book for hours at a time. 2. I'm an avid gardener but often times don't plan out my plantings - and so usually end up moving them here or there until I find the best growing spot for that particular plant! 3. I love the smell of my lilac bushes when they bloom in the spring. i have a whole row of them which acts like a natural fence and also fills the yard with their lovely aroma. I bring them in the house and to work so I can enjoy them during their brief blooming time. 6. I painted the whole bottom half of my 2 story house by myself years ago when I was a single mother/homeowner - had to finally hire someone for the top half - just couldn't do the tall ladder while juggling a paint can! 7. I try to walk an hour every day. Now hop on over to these great blogs of people I know on SCS and leave some comments on their great cards! So yesterday I saw on Danielle's blog - Wild Dragonfly Designs - that she tagged me. That means that I am now supposed to list 7 Random Things about myself. So here are some things that make me who I am. 1. I am a person that makes lists. I have 'stickies' all over my computer at work, in my stamping room and several stuck to my kitchen cabinet above our eating counter so that I see those every day until the items on them are done. If I don't make a list - I promptly forget what I was supposed to do. My mother always made lists so I guess I learned it from her - but I really could not function without writing my lists! 2. Seeing a beautiful sunrise or sunset, a giant harvest moon on the horizon, or riding in NH or Maine and turning a corner to a vista of tall mountains - takes my breath away. 3. I always order the same meal whenever I go to particular restaurants - I don't mean I only eat one thing whenever I go out - but I have a different favorite thing at each restaurant. It drives my husband crazy - he says I should try new things - but I say, I know what I like and if I order something different - I often don't like it! 4. I love traveling to other states and countries - I never traveled far when I was young as it was too expensive - but as an adult I have been able to travel more and I love seeing how people live in different areas and the different topographies etc. 5. I have a very bad sense of direction. I never know if I'm going north or south or which way I should turn on a road when given a choice - when I finally learned how to read a road map it helped a little (what an ingenious thing, a road map - you can actually get from one place to another by following the roads on it!!) Usually I'm traveling with my husband and then I leave it up to him - he used to drive a truck - so he is really good on getting places! 6. I love to do things outside - gardening, walking, snowshoeing, hiking, bird watching, easy mountain climbing and Kayaking are a few of the things I like to do. 7. I am a collector - some of the things I have collected over the years: Noah's Arks, dolls, antique quilts, anything antique!, Wallace Nutting Pictures, tea cups and now STAMPS! So there you go - now you know me a little better - hopefully you will still be my friend!! I'm supposed to tag some other bloggers - but Danielle already tagged Linsey and these two ladies are my only close blogger friends at the moment being new to blogging! so - I may have to blog someone later on!! check out their great blogs! thanks for stopping by - do you want me to tag you??? LOL! leave me a comment! !